Launching in the UK this December, a dance battle that has already captivated thousands; JUST BOLLYWOOD! Dubbed as the ‘most anticipated event of the year’, Just Bollywood is the UK’s first inter-university Bollywood Fusion dance competition, pioneered by a handful of students at Imperial College London. What started as a simple idea has catapulted into a nationwide brand that is set to revolutionize the UK Bollywood scene. Just Bollywood will take place at the revered Logan Hall in London on Saturday 13th December 2014. Tickets are selling fast for inaugural contest, and start from as little as £15, so don’t miss your opportunity to be witness something truly special and worthwhile. 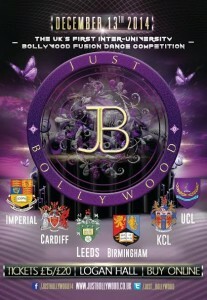 Buy your tickets now for this dance extravaganza through the official website-http://www.justbollywood.co.uk/. 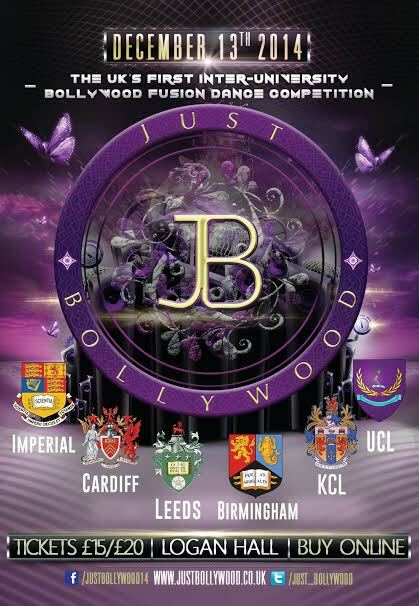 The participating universities of Just Bollywood 2014 are Imperial College London, Cardiff University, University of Birmingham, Kings College London, University of Leeds, and University College London. Siri Potluri, the captain of the Cardiff University Just Bollywood team said, “We are all very excited about Just Bollywood. It is the first real chance to put Cardiff Asian society on the map and be recognized as a culturally diverse university through our passion and love for dance”. Charity is an aspect that resonates down to the very core of the competition, with the British Asian Trust as the official charity partner. Whilst Just Bollywood showcases the best Bollywood university talent in the UK, it also incorporates altruism into the soul of the competition and raises awareness of an extremely important cause; tackling the profound still found in South Asia today. More significantly, all profits of this year’s Just Bollywood will go towards funding the British Asian Trust’s anti-child trafficking project in India. Founded in 2007 by HRH The Prince of Wales, The Trust has already touched the lives of more than 1 million people in the poorest communities worldwide. They do this by investing in high-impact local charities known to deliver lasting change, transforming lives through education, health and livelihood initiatives that generate self-sufficiency. This year we are putting the money raised to a charity that works in the area of anti-trafficking with a focus on sexual exploitation. Karan Pangali – Dance sensation and artistic director of KSPARK entertainments, Karan Pangali catapulted to fame as the only British dancer to make the final of Hrithik Roshan’s ‘Just Dance’ competition. He has also attained the title of an extreme dancing hero after combining stunts with dance in Akshay Kumar’s international television show, ‘Dare 2 Dance’. Leena Patel – an international celebrity choreographer, who has choreographed and performed with top Bollywood Celebrities such as Shahid Kapoor, Sonakshi Sinha, Jacqueline Fernandez, Ali Zafar, Malaika Arora Khan and Bipasha Basu. She is also the lead dancer of Bollyflex, a Bollywood dance group that made history by being the first of its kind to perform in Strictly Come Dancing. Bollyflex also made it to the semi finals of Got to Dance, garnering standing ovations and raving reviews all around. Leena Patel revealed, “I’m really looking forward to judge the talents competing”. Samir Bhamra – the creator of Phizzical, a theatre production company based in West Midlands, which create exciting and spectacular live performances to entertain audiences of all ages and backgrounds. As well as incredible dance performances from the 6 participating universities, audiences will also get to see a performance from the renowned Punjabi By Nature (PBN), who have produced huge Bhangra tracks like ‘Phitteh Moo’ and ‘Aashiq’ featuring Miss Pooja. Bollywood is a fusion of many diverse dance styles, ranging from ballet, bhangra and Bharatnatyam to hip-hop, street and salsa. This allows each Bollywood dance act to be unique and be a creative artistic challenge for choreographers and performers alike. The storytelling aspect, synonymous with Bollywood, further distinguishes each performance, with expressions making them more lifelike and memorable. Moreover, the incorporation of numerous styles has allowed people from different ethnic and dance backgrounds to take an active interest in participating in Bollywood dance on a global scale. The show is sponsored by its media partners, Sunrise Radio, the leading British Asian radio station. “London’s Asian community is young and growing with over 50% under the age of 40. They are an interesting mix of east meets west, however there is one thing which remains consistent and this is the love of Bollywood and the music it produces,” said Tony Lit, MD of Sunrise Radio 963/972. “Bollywood influences style, fashion, dance and most importantly music. Sunrise Radio is committed to supporting young Asians in connecting or reconnecting with their culture and heritage and I have great pleasure in sponsoring the Imperial College London’s, first ever inter-university Bollywood Fusion Dance Competition, ‘Just Bollywood’ in December”. Ernst and Young is a key sponsor for Just Bollywood. Ernst and Young is one of the big 4 audit firms, operating as a network of member firms which are separate legal entities in individual countries. It has 190,000 employees and more than 700 offices in over 150 countries. It provides assurance (including financial audit), tax, consulting and advisory services to companies. It has therefore provided a solid foundation for Just Bollywood from a monetary perspective in its debut year, allowing the show to expand and prosper financially for many years to come. Just Bollywood will take place at the revered Logan Hall in London on Saturday 13th December 2014. Tickets will be selling fast for inaugural contest, and range from £15 to £20, so don’t miss your opportunity to be witness something truly special and worthwhile.